DirectionsTo reach the Byers Peak Wilderness from the Fraser/Winter Park area head towards the Fraser Experimental Forest on Grand County Road 73. Turn right onto Grand County Road 50 and continue on CR 50 past Crooked Creek Ranch and Church Park. At Church Park head south onto Grand County Road 32 and continue heading southwest. After a few miles you will eventually reach the turn off to Grand County Road 325 and the Lake Evelyn Trailhead. There should be a sign directing you to the trailhead.The road to the Lake Evelyn Trailhead is rough but manageable for most vehicles with decent ground clearance. The road can be narrow in sections so please use caution. 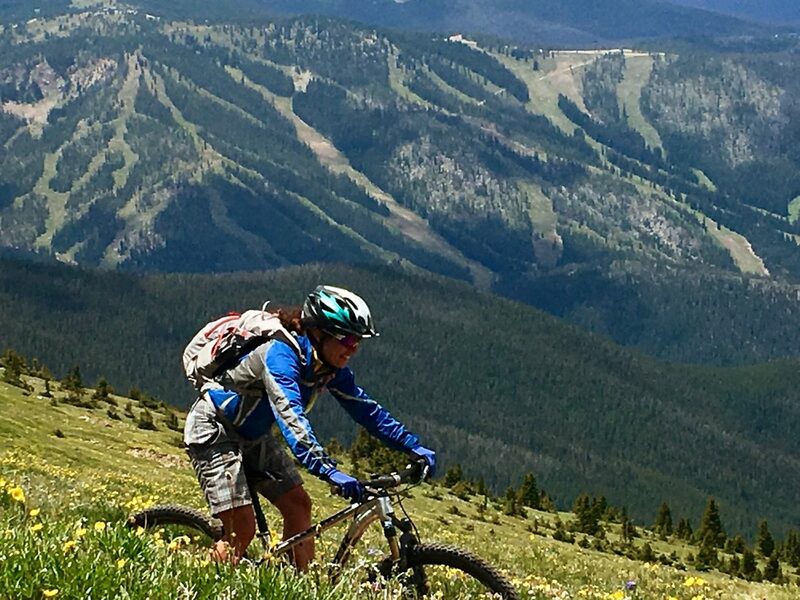 Grand County’s proximity to the Denver metro area and the broader Front Range corridor means large numbers of recreators travel to our little corner of the high country every summer. Tourist activity can be almost dizzying during summer months, with long lines of traffic snaking along the major thoroughfares of our region. For many visitors to the Middle Park area, especially those from other rural areas, the high concentration of vacationers in certain areas can be daunting. That is why we recommend checking out some of Grand County’s less popular, though no less beautiful, regions. You’ll find picturesque mountain meadows, majestic views and comparatively little congestion. Just a short ways east of Winter Park and Fraser is one of my favorite sections of Grand County: the Byers Peak Wilderness. Many who come to Grand County are already familiar with Byers Peak, which towers above the Fraser Valley like a lonely sentinel, with lesser peaks rising diminutively all around it. Most who make the journey up Byers Peak access the mountain’s trail through the Fraser Experimental Forest. The Experimental Forest is a wonderful place with remarkably easy access and relatively high quality roads making it ideal for day trips. Unfortunately the easy access and proximity to the Fraser/Winter Park area means the Experimental Forest see heavy summer use, especially on weekends, and the area can fill up quickly. 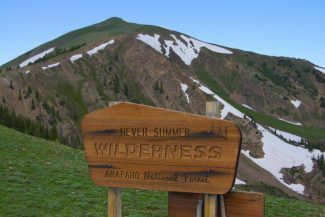 Just over the western ridgelines from the Experimental Forest is the Byers Peak Wilderness. The best access point for the Wilderness is the Lake Evelyn Trailhead. From the Trailhead adventurers can reach a number of regional highlights including the crystal clear tranquil Lake Evelyn. The trail to Bottle Pass and Ptarmigan Peak winds up from the Lake Evelyn Trailhead along an old logging road carved into the side of the mountain. After traveling up the gentle grade a ways the trail suddenly cuts away from the logging road, taking hikers directly into the denser forest. As the trail nears Bottle Pass the path becomes harder to follow and eventually disappears. The last several hundred yards of the trial can be difficult to follow. The route is marked by stone cairns with large branches poking skywards from the center of each pile. Locating each cairn can be a challenging experience but the journey is a fun one. If you find yourself getting lost among the cairns while heading for Bottle Pass head back down the mountain and find one of the cairns you have already passed before resuming your search up the mountainside. In most instances the next cairn further up the mountain is visible from the previous cairn lower down the mountain. Eventually hikers will emerge from the scrub brush and lodgepole pines into the small defilade between Bottle Peak and Ptarmigan Peak known as Bottle Pass. From Bottle Pass hikers can head left to Ptarmigan Peak or right to Bottle Peak. Ptarmigan Peak is a broad tapering mountaintop easily summited from Bottle Pass. 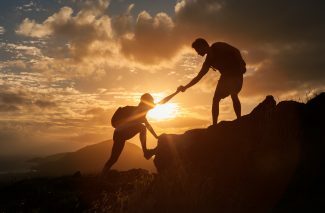 There is no defined trail from Bottle Pass to the top of the Peak but no trail is needed. 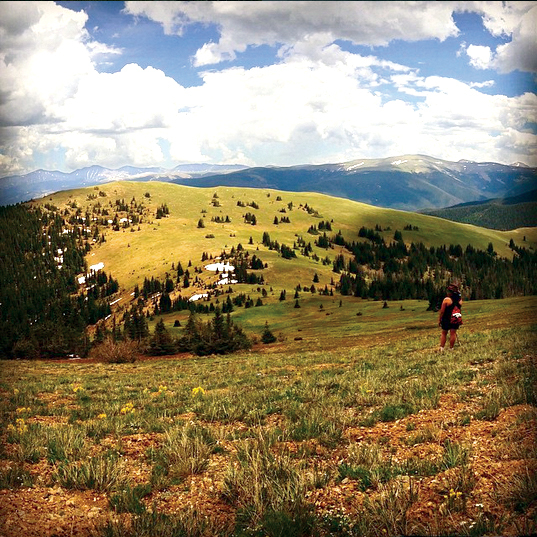 The top of Ptarmigan Peak offers some of the grandest vistas of Grand County. From the top of Ptarmigan folks can look out across the entire Fraser Valley, view Granby Reservoir glistening in the distance and even catch site of far off Kremmling to the north; binoculars help. Bottle Peak rests just a few hundred yards away on the opposite side of Bottle Pass. From Bottle Peak hikers could, if they so desired, head south down the Bottle Peak ridgeline towards Byers Peak. The trail south from Bottle Peak winds its way down into the Fraser Experimental Forest and the Byers Peak Trailhead. 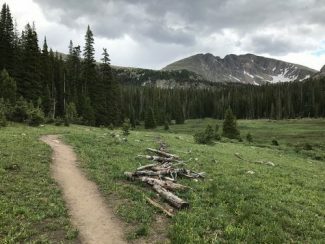 For the more adventurous, or those in better physical condition, the Byers Peak Wilderness also offers trails to Bills Peak and Horseshoe Lake. If you plan to head deep into these back country areas please come prepared. The lakes and peaks of the region are several miles from the Lake Evelyn Trailhead; which is itself many miles away from other amenities such as hospitals. There is little to no cell phone service in the region so please plan accordingly.